There are many other things that I should be doing. I am in the middle of a piece about Death, I interview somebody in an hour, I have a study that looks like a store cupboard nobody cares about, and everybody chucks their stuff into. I should be researching, planning and tidying to enable a more structured work routine. This is how you make them. It’s a recipe from a Jamie Oliver magazine from a few years back, the method of which I’ve adapted slightly. The recipe says it makes 12, but you could easily make 24 small ones (and even then, not that small). These were, actually, iced ‘fingers’ but I prefer the word bun. I made 12 and they were as oversized as the eyes on a Bratz doll. Next time I’d make them smaller. Stir the yeast into the milk and set aside. You don’t need to wait for it to froth up or anything. Mix together the flour, sugar and salt together. Now stir in the yeast/milk mixture and the rest of the ingredients, mixing it all together. You’ll have a very wet dough that looks almost unmanageable. Leave it in a bowl for 10 minutes. Oil a work surface or board (wooden boards don’t work so well for bread kneading, I use a Top Gourmet one which is made of recycled cardboard and it’s brilliant for all my bread making) and tip the dough out. You may need to scrape it up with a scraper to begin with but don’t be tempted to add flour and don’t panic. You can do this. It’s buns you’re making, just think of that. Knead it very lightly for about 10 seconds, then cover and leave for ten minutes. Do this twice more. By the end you should have a smooth dough that is slightly more manageable. Now leave it, covered in an oiled bowl, for about an hour and a half. It should have doubled/risen quite a bit. At the end of this time, knead it lightly one more time and cut bits off it and roll into either circles (I used flour for this last bit) or sausage shapes. If you want to be really precise, weigh the whole dough, work out how many buns you want, then divide one by the other so you end up with buns the exact same size. 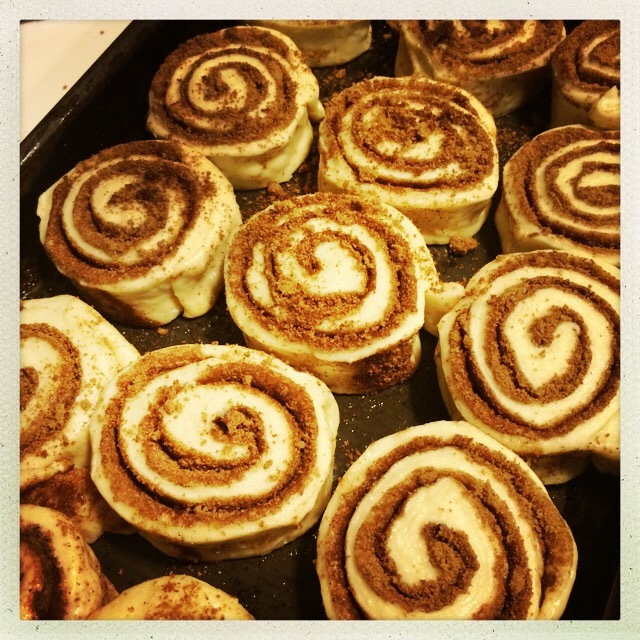 Place whatever size/shape bun you’ve made onto a parchment lined tray. The buns shouldn’t be touching yet – they reach out to each other as they rise. Cover and leave in a warm place for 30 minutes. I left them at room temperature – 20c – for 90 minutes (not on purpose, I got held up) and when I came back they’d blown up to enormous proportions. All was fine, I had very big, very light, very fluffy buns. But it was touch and go until I got them in the oven. I’d say give them an hour at an average room temperature. Into a preheated oven of 200C, place the buns for 10 minutes or so. You want them to be lightly golden. When done, take them out and cool completely. They’ll be all squashed up against each other and you’ll have to tear them apart to reveal their inner fluffy softness. Now mix up the sugar and water to make the icing and spread it on top. The icing won’t be pouring consistency – it’s much thicker than that. So you need to spread it on with a knife but as it dries it smooths out so don’t worry about it not looking lovely and slick when it first goes on. Don’t store these in an airtight container. The buns need to breathe or the icing will slide off. So you may want to freeze half (un-iced in which case make half the quantity of icing) as these make rather a lot. But they are fun to give away. Everyone seems to like an iced bun. These are great for school fetes for that reason – children and adults like them – and they are not overly expensive to make. I think, and my eldest agrees, that these taste even better the next day. They didn’t last into a third though. This entry was posted in Buns, School fete and tagged buns, iced buns, iced fingers, school fete on May 7, 2014 by Annalisa Barbieri. My friend Vicky made this chocolate banana loaf the other day with her ducks’ eggs. I’m not usually a fan of banana bread. I want to like it, ever since I read that Nigella says making banana bread fills your house with domestic fug, or some such. But I just don’t really like it. I’m not a fan of an overly banana taste in anything other than in a, you know, banana. But this looked different, thanks to the abundance of chocolate and cocoa in it and on it. And then I had a child off sick the other day and so we decided to make it together; but into cupcakes not a loaf. And it worked brilliantly. As you will see in the comments below the actual recipe in BBC Good Food magazine, lots of people have modified the recipe to make it even healthier with less sugar, more bananas, honey etc. I am obedient so, as it was the first time I made it, I followed the recipe. I used Isigny Creme Fraiche instead of ‘sour cream’ (it’s the same thing anyway isn’t it?) 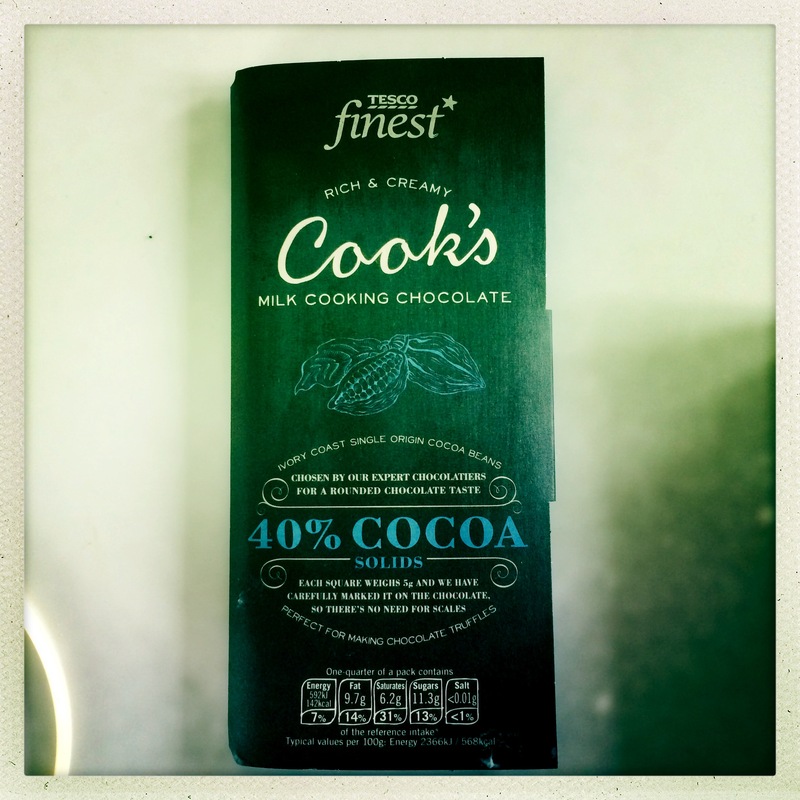 and I used Tesco’s Finest Cooking Milk Chocolate with 40% cocoa content which is fantastic, even if you do have to go to Tesco to buy it (stock up). I hate hate hate buttercream icing so this is great for me. My youngest didn’t like the topping so I left some clear for her which was convenient as, making it into cupcakes rather than one loaf, I didn’t really have enough frosting (if you want to cover all of them, make double of the topping). You can top with a banana chip if you want. I make my own, using my dehydrator, but obviously you can just BUY THEM. Update: I have since made these again using coconut oil instead of sunflower oil (v nice, you don’t really taste the coconut) and also half wholemeal flour plus half a teaspoon of baking powder. Just to make it more healthy. If anything, I think the cupcakes tasted better..and because I’m lazy, I’m reproducing the recipe, as I now use it (i.e. adapted) here for my reference..
Line each cupcake mould with a case – this makes about 16 so you may need to cook in two batches. Heat oven to 160C. Mix the sugar, flour, bicarb, cocoa and chocolate in a big bowl. Mash the bananas in another bowl and mix in two egg yolks plus one whole egg. To this, add coconut oil and milk. Add the banana mixture to the dry flour etc mixture, mixing well but not overmixing (I never understand why, what happens if you over mix it??). Stir in a bit of the egg white mixture to loosen it all up, then fold in the rest to keep the air in as much as possible. Spoon into cupcake cases and bake for about 25 minutes – 30 mins. A skewer should come out clean, unless of course you hit a bit of melted chocolate chip. Let them cool completely. In the meantime, melt the creme fraiche and chocolate together, in a bowl over simmering water, with the pinch of sea salt if desired. Then spread over cupcakes (if it’s really gloopy let it firm up a bit in the fridge first, but not too much). Top with a banana chip if you like. This entry was posted in Cakes, Children, Chocolate, Picnics, School fete and tagged 40% cocoa, banana bread, banana loaf, chocolate, chocolate banana cupcakes on March 21, 2014 by Annalisa Barbieri.